By Rick Henderson, ink-stained, pixelated wretch; political writer and editor; alum, UNC-Chapel Hill (A.B. 1979); aficionado, American roots music and eclectic pop culture; cheap wine snob. 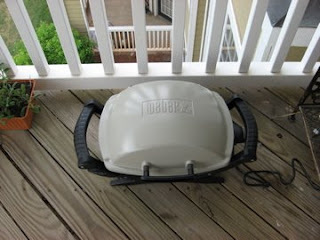 Because years ago some careless dolt didn't pay attention to his grill (and burned down his apartment building), it's against the law in North Carolina to have any grill using an open flame on an apartment balcony or patio. Gas or charcoal grills must be at least 10 feet from the structure. Which makes barbecuing on the third floor a challenge. Not grilling was not an option. 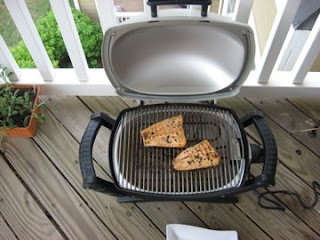 So I had to obtain an electric grill and researched the alternatives. The result: A Weber (duh). The Q series comes in gas and electric models; and if you saw "Dear Food Network" last week, you'll recall one of the hosts (it may have been Aida Whatsername) cooking on one of the Q series gas models. This grill is not cheap. We got it at Bed, Bath & Beyond and using the standard 20% off coupon it was about $220 including tax. 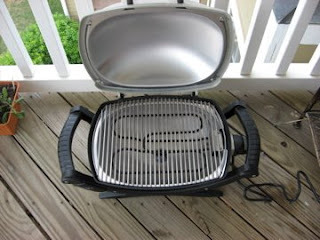 But it's a terrific grill that should last for years. 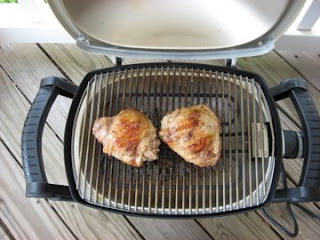 And when we move to a house, I can see it being our primary grill when we don't use charcoal -- when we're cooking for just us and it's burgers or hot dogs or any veggie or non-steak protein that requires direct heat and can cook in less than 15-20 minutes. In other words, we probably won't need a gas grill to supplement our Weber kettle. On the highest setting, the Q-140 can reportedly reach temperatures of 600 degrees F. That's because Weber developed a reflective coating for the cover and the base that intensifies the heat from the element. All I know is, it really can sear meat, as you can see from these pork chops. The final word: An outstanding alternative to lousy tabletop appliances or cheesy George Foreman models if you can't have an open flame. Comes apart for easy cleaning, too. And you can buy accessories, including a stand with wheels (and trays) giving you all the convenience of a "real" patio grill. Highly recommended, notwithstanding the hefty price tag. And what do you mean "non-steak protein"? Come on down. Saturday around 5 for cocktail hour. As for "non-steak protein," you got your fish, your pork, your poultry. Not tofu. That stuff ain't touching my Weber. Nice looking grill. Nice looking food. 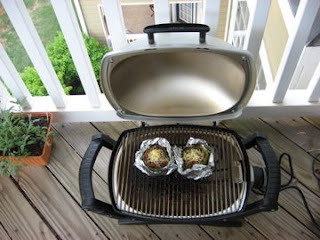 Electric grills are very useful if you want to grill your barbecues indoors. Problem is they are very expensive in electric consumption, plus the charcoal from the traditional grills adds a distinct flavor. I'm a North Carolina native who's delighted to be a poltical journalist (managing editor, Carolina Journal) still earning a living in my home state. I also love my wife, our pets, growing succulents, and Merlefest.